A short and urgent post, kind readers. Faustus wonders “whither” and even if he can fly, but you shouldn’t have to suffer from the same directional despair. I know exactly where you should go: the movies. 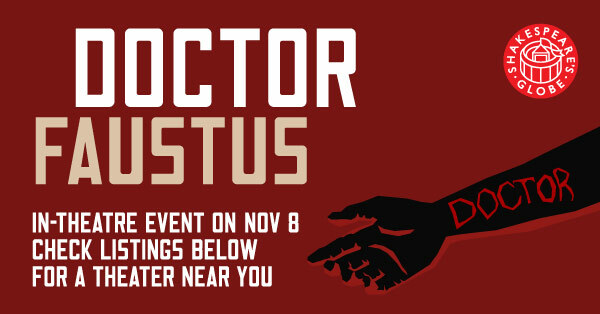 I’ve JUST THIS SECOND returned from seeing the Globe’s production of Dr Faustus on screen. That’s right, The Globe. Dr Faustus is one of my favorite plays to read, but seeing it (especially with a friend who studies Early Modern drama) has sent me over the moon. – Mephistopheles: portrayed differently from how I read him, but the actor is so compelling, so moving, so authentic, even, that I found myself nearly overcome by his performance. –Robin: I usually skim the comic interludes, but the actor who plays Robin is simply brilliant. –costumes: right for the stage of the Globe, the costumes are period-appropriate with the perfect amount of contemporary ingenuity. –props: fantastic– a couple of elementary magic tricks, a few trap doors, and some damn-near-War-Horse puppets take advantage of the setting without getting carried away. (nb: COOLEST DRAGONS EVER). –it’s the feckin’ GLOBE, yet the director for the screen is as gifted as that for the stage. This was no “stick a tripod in the corner” production. The camera gives great balance between zooming in and letting us see the stage as a whole; watching it on screen didn’t feel inorganic or forced. The next **and only other** showings seem to be on November 13. Until next time, readers, may you fly closer to the theater than to the sun. What do the sheep say?